US #2135 from the Transportation Series. Click the image to buy. 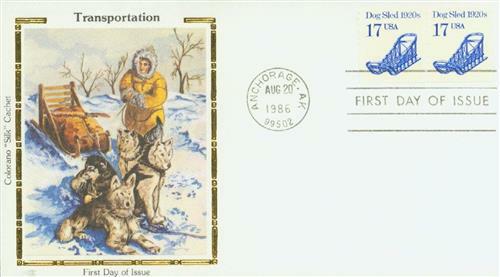 On January 8, 1963, Chester Noongwook made his final trip delivering mail in Alaska via dog sled. 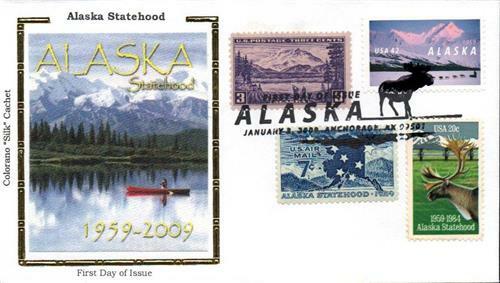 Mail delivery in Alaska has long been more of a challenge than in other parts of the United States. The extreme temperatures and long stretches of undeveloped land in the 1800s made mail delivery difficult. Letters sent from the continental US could take weeks or even months to reach their destinations. Often, mail would be sent to Washington where it was loaded on to steamships in the Puget Sound. These ships would then carry the mail to southeastern coastal towns. From there, the mail was transported into the interior sections of Alaska by river steamers and later trains. However, trains couldn’t reach some of the most remote areas and ships couldn’t pass frozen rivers, so other methods of delivery were needed. US #2135 – Silk Cachet First Day Cover. Click the image to buy. Sled dogs proved to be the answer. They could travel long distances day or night, over frozen lakes and through dark forests. Native malamutes, huskies and Eskimo dogs were a natural choice. They were strong, had thick coats, furry paws, and didn’t need special housing. At one point they tried using horses, but their feed was expensive and they couldn’t handle the cold as well. 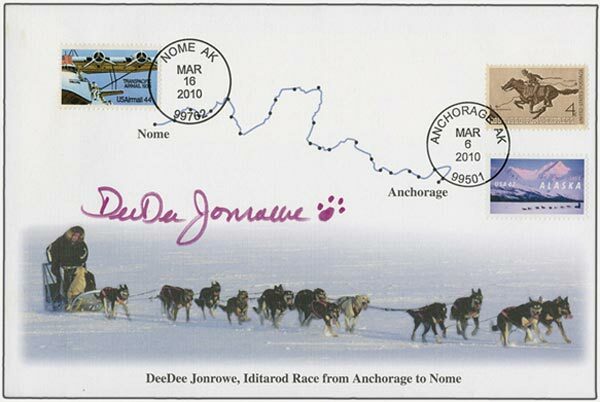 US #4374 – Issued for Alaska’s 50th anniversary, this stamp pictured DeeDee Jonrowe as she completed the 2000 Iditarod Trail Sled Dog Race. Click the image to buy. Most dog sled teams consisted of eight to ten dogs pulling sleds carrying between 500 and 700 pounds of mail. The mail was carried in rubber-lined waterproof bags and the dogs wore moose hide moccasins to protect their feet from sharp ice. By 1901, Alaska had a system of mail trails that ran along almost the entire length of the Yukon River. 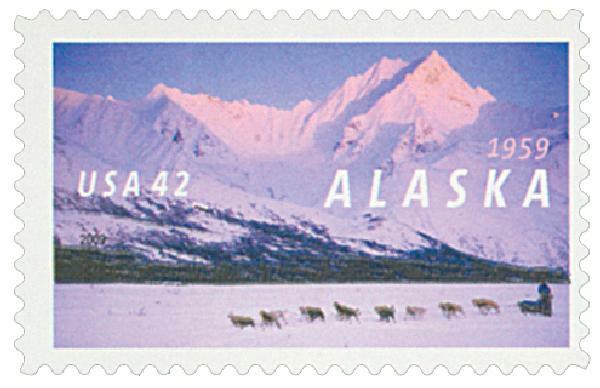 Much of the mail was carried along the 2,300-mile Iditarod Trail from Seward to Nome. US #4374 – Fleetwood First Day Cover. Click the image to buy. Dog sled mail delivery made a huge difference to the people of Alaska and it was widely in use for the first three decades of the 20th century. Then in the 1930s, airplanes slowly began to replace dog sled mail. The change was relatively quick and smooth in aviation centers such as Fairbanks. But it was a much longer process in the more remote areas where they needed to develop airfields. US #4374 – Silk Cachet Combination First Day Cover. Click the image to buy. By the 1940s, most sled dog teams were replaced by airplanes. However, one sled dog team continued to operate into the 1960s. Chester Noongwook made weekly 100-mile mail runs from Gambell to Savoonga. Even as airstrips were built in both towns, he continued to carry the mail when the planes couldn’t make it in. He made his final trip on January 8, 1963. 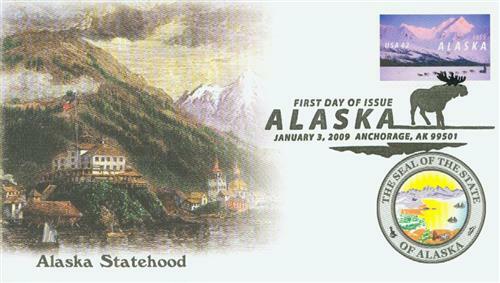 Item #FD1112 – Iditarod autographed First Day Cover. Click the image to buy. Upon his retirement, Noongwook was invited to Fairbanks, though he didn’t know why. Ironically, he was to fly to Fairbanks, but the plane was delayed by four hours due to poor weather. Once he finally arrived in Fairbanks, he was honored to receive a special award for being the last sled dog mail carrier. This entry was posted in January 2019, This Day in History. Bookmark the permalink. 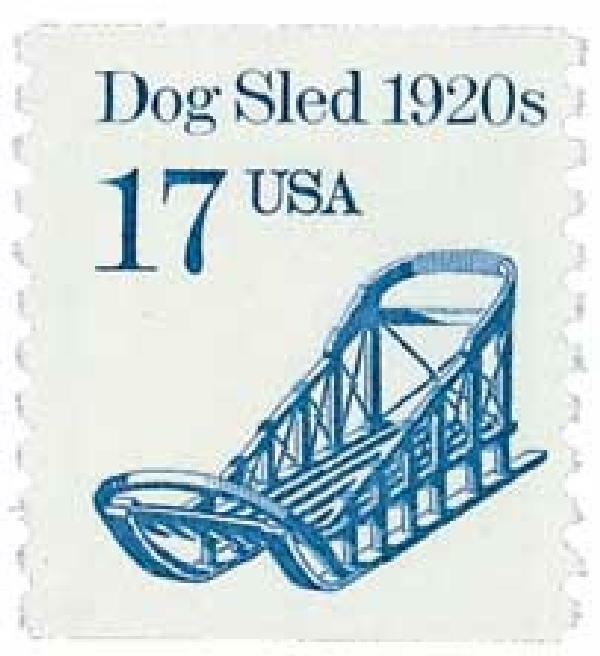 5 Responses to "This Day in History… January 8, 1963"
Nice to know why Dog Sled was used on US postal stamp. I thought Dog Sled was just another mode of transportation. Chester Noongwook would be a good candidate for a commemorative stamp! Wonderful details about Alaska’s final Dog Sled ! Now there’s a fun definitive set to look for color, tagging, perforation, and other differences. But the dog sled wasn’t one with many varieties. Thanks Mystic for the dog sled mail story.